My family went and played wiffle ball last night. While my son (heretofore referred to as The Kid) was up to bat, Alex pitched and I played outfield. One of The Kid’s hits was a fly ball. He popped it directly in the sky, where it flew right towards me. As it hurled towards my face, I started to panic, but, by george, I caught it and I celebrated like I had just caught a grand slam at Ranger’s Stadium by flying into the stands. At the same time, an elderly woman was walking her dog and she complimented me on my catch. I exclaimed, “Oh, I’m just making up for elementary school PE!” and she said she was a retired PE teacher. Then, I had one of those flashback moments, with the cheesy music and the cinematography that looks like a wave. On the whole, elementary school PE was not my brightest moment. I would call all of my embarrassing stories from that particular class ‘antics’, but antics implies that there was some intentionality behind my actions and I assure you, I did not mean to do what I did. I am not now, nor have I ever been, a natural athlete. In elementary school, I was a tubby bookworm who much preferred science experiments over running around the track. During the Presidential Fitness pull-ups test, the evil PE teacher would line our class up in front of the monkey bars and call each student up one by one to see how many pull ups they could do. When it was my turn, I would hang on the bar, arms fully extended with my face looking up towards the heavens, until I fell off and took the walk of shame in front of my class. To this day, I have not ever done one pull-up. 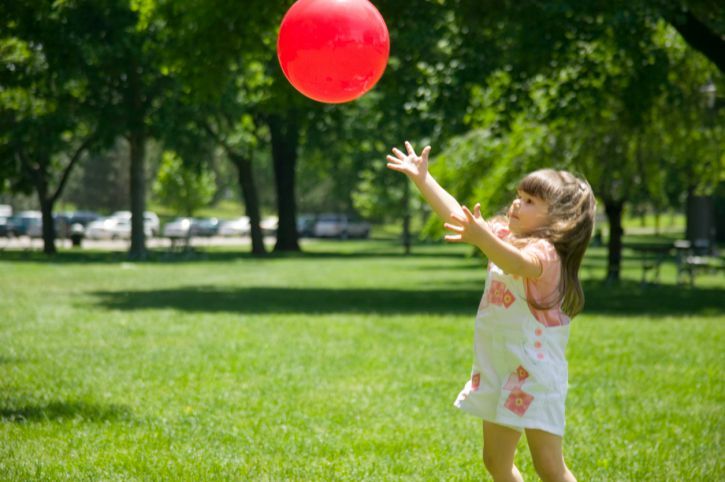 In late elementary school, one sport I particularly loathed was kickball. Whoever was unfortunate enough to end up with me on their team would stick me in the outfield, where I could stand or sit or lay down instead of paying attention to the game. In the rare occasion that some jock actually kicked a fly ball into the stratosphere and it fell back down in my orbit, I would stand directly underneath it with my arms outstretched, watching as the ball loomed bigger and bigger, until it got close enough to bounce off the tips of my fingers, jamming them, and bounce jovially away, while I was left with at least six jammed digits. I remember crying several times during kickball. My PE teacher would slink over with hunched shoulders and massage my fingers and then tell me to just catch the ball next time. It was after one of these emotional games that a jerk named John Brown said something to me (I’m sure it was about losing the game for our team) and I called him a slave (the jerk John Brown was white; we had just learned about the abolitionist John Brown, who was also white; I was taunting him with an ironic knowledge of history). I was sent to the principal’s office, of which I knew I would surely die. She didn’t even have to say anything to me; all I had to do was enter the threshold of her office and know that I was not there for an academic award and that was enough to scare me straight for the next 12 years. That visit did nothing for my hatred of that government-mandated group exercise time. Needless to say, PE was just not my thing. Truthfully, I’m not sure there’s anything I could have done to make it better. Oh sure, my dad could have pried that Babysitter’s Club book out of my cold dead hands and forced me out in the yard to play catch, but that wouldn’t have fixed my kickball problem and doing pull ups on the Presidential fitness test? No way. I went to dinner with a friend a few weeks ago, Mrs. Jennifer Green. We ended up at Cheddars, where we sat eating a bowl of queso and chips while we talked life. At one point, I asked Jennifer about spiritual discipline, being disciplined in reading and praying and the like. I explained to her that, in college, I basically deconstructed my entire faith and then rebuilt it from the ground up. Spiritual disciplines didn’t make the cut because I had previously been incredibly legalistic, where I felt guilty when I didn’t write in my daily prayer journal every morning and not reading my Bible basically meant that God was mad at me. I needed some space from spiritual discipline because it had become so unhealthy. So, I threw off that legalism with reckless abandon and I’ve never really been able to find it again, except for the guilt and shame that seems to follow me everywhere. When I finished, she looked at me and said, “I can see you’re feeling guilty about this. I see it all over your face”, to which I responded with teary eyes and a heavy sigh. Then she proceeded to speak truth over me. The truth that I find God in lots of different ways, in parenting, in my work, in the quiet moments. Of course, reading my Bible is important, but it’s not as important as living my life with Jesus by my side. She told me that God was in control and I follow God. “If He wanted you to be reading your Bible, then there ain’t nothing in the world that can stop you from reading your Bible.” She spoke the truth over me that there is nothing that I have to do to be “enough”. I’m already enough. So, I sat crying over my baked potato soup, while Jennifer’s chicken fried steak grew cold. How many times do I have to hear that I’m already enough? How many times, in how many different ways, does God have to tell me that He already loves me as much as He possibly can? I literally can’t do anything else to make Him love me more. The Truth (with a capital T) that I am enough already, that I came into this world being loved by my Creator, is like that stupid red kickball. Daily, God lobs it in my direction. I see it; I know what it is; I know that I’m supposed to catch it and hold on to it. Instead of catching it, it bounces off my face. Thankfully, there have been days, like that day where I had the miraculous wiffle ball catch, where I get it. The Ball of Truth somehow falls perfectly into my outstretched hands and I clutch it to my chest, feel the weight of it settling in my arms. On those days, I can live out of that Truth, instead of just living with it. I might always struggle with this. My hope is that those good days will become less “few and far between”. I hope that as I catch the ball more often, I can get used to the feel of the rubber on my fingers, the motion of catching. Maybe I can practice this. Maybe, someday, it won’t feel like a miracle when I catch it. For now, I’ll take what I can get. I’ll take the memories of the days when I got it and use that to carry me forward, to remind myself that I am enough, even if I don’t feel it. And THAT is what I can take away from elementary school PE. Yeah, she’s not going to catch that.. Tags: embarassing, gettin fit, jesus. Bookmark the permalink. Way to catch that ball Beth! When I was playing wiffle ball with A&c last week I swung too hard, twirled all the way around and fell down, AND Max the pitcher caught the ball and I was out. Nothing like sports to raise you up and smack you down. You insulted him with an ironic history fact. 😂😃 I’m dying! Great post! I can relate to most of it – been the legalistic, been the struggler. Now rest in the Truth that God is so passionately in love with me and is NOT angry with me. Spiritual disciplines are making a small comeback. May I suggest Sacred Rhythms by Ruth Haley Barton if you feel like exploring it. No shame or guilt if you don’t. I’ll check it out Thanks for the tip! And I can totally relate to all the PE memories too – hanging at the pull-up bar (still never done a pull-up) and always getting picked last for kickball (hated it too) and I even cried at my 7th grade volleyball B team – but not for as good a reason as you. It was our first game, and I was a nervous, anxiety-ridden mess. Every time the ball came near me, I panicked and teared up. My coach called a time-out and chewed me out for crying. Which, as you can imagine, worked beautifully to help me stop. Let’s just say that was my last year to play volleyball. Just thought I’d share – thanks for the trip down memory lane!